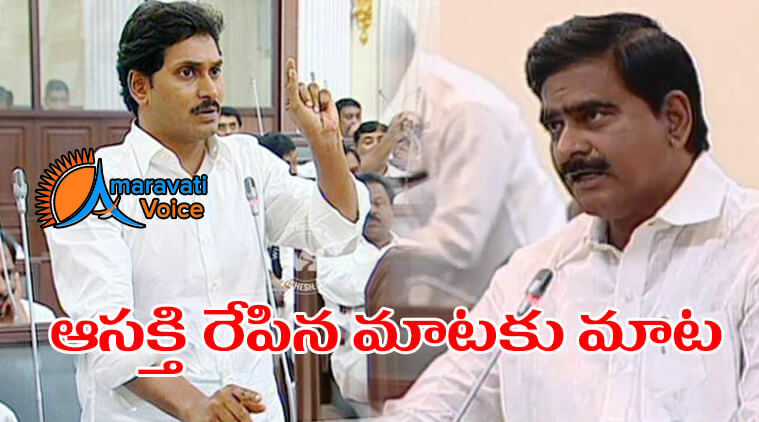 It is known that the ruling and opposition parties comment on each other for silly causes may be for publicity or to say that they were fighting had for people.The same drama goes on even in the assembly sessions of telugu states.The oppostion leaders who regularly used to fight with their words in assembly has turned wild in recent times. A few days back Roja turned her tounge violent making many leaders shed tears and disturbed the sessions many times for which she was awarded a gift of leave for one year which now made all the members to remain quite and calm behaving gently while discussing on problems of people. Even though YSRCP members attended with black badges a s a protest against Roja issue today, the assembly seemed to be a bit professional, where the discussion between Minister Devineni Uma and YS Jagan looked interesting and grabbed interest of viewers and members in assembly. YS Jagan, who rose from his seat commenting on projects held by CBN Government, said that the projects were completed by his father long back and now CBN was just decorating them to launch and even said that the whole credit goes to YSR, who inagurated the projects. Devineni Uma interuppted at this point saying that everyone knows how YS granted and earned on projects. He even continued to say that its the result of their leader CBN ‘s hardwork and vision, they took interest in completing the half done and left projects by previous Government.